Rolfing sometimes called: Structural Integration, is a form of connective tissue manipulation and education based on the fact that the body is malleable, pliable, or more accuratelely termed "moldable" ! Thickening and shortening of fascia, (a type of connective tissue) can cause bad posture, restrict movement and cause chronic muscle and joint pain. Rolfing is an incredible way to restore the body to optimum alignment, which can ultimately improve movement, function and release pain patterns. Some changes are very visable and as a Rolfer, I am still "blown away" by the positive changes especilally when I review the before and after pictures. Other changes may be obvious in a different way such as a happier look or attitude. I often find people coming into my office after a few sessions having a more confident walk or stride, or an easy fluidity that was not there before. I see these positive changes over and over in my clients. Probably the most common reason people come for Rolfing is chronic muscle & joint pain. In many cases, this pain has been with a person for many years. Many times clients have tried various doctors, chiropractors, acupuncturists and in some situations they have had surgery or are considering one. I am happy to say that many times (but not always as no modality can claim perfection), the client is given relief or the pain goes away. The reason is simple: Other modalities or influences do not address the full body pattern in the fascia like Rolfing does. Dr. Ida P. Rolf (1896-1979) developed what she originally called Structural Integration. 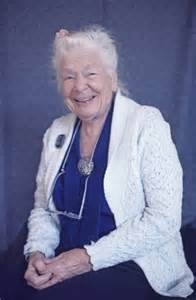 She has been described as a brilliant scientist who began her career as a research biochemist and later turned her genius to dealing with structural problems of her family and friends. Her clientele grew and most clients bragged that they were going to be “Rolfed” or “Rolfed over” so the word Rolfing® was coined and is now a registered service mark of the Rolf Institute in Boulder Colorado. Dr. Rolf’s term, Structural Integration is still a much better generic description for this kind of bodywork, since it is truly a system for integrating the human physical structure. It is a form of connective tissue manipulation and education based on the fact that the body, is in some respects plastic, or maybe more accurately it is to be considered malleable. Webster’s defines malleable as: plastically open to outside forces or influences; having the capacity for adaptive change. This characteristic truly applies to our human structures and enables the body to be anatomically ordered, thus lengthened and centered along it’s vertical axis. The picture below illustrates this vertical axis and the lift you get at the axis when all the segments of our structures are in alignment. You can determine if you are centered along the vertical axis if we were to draw an imaginary plumb line down the side of the body. Ideally the ear, shoulder, pelvis, knee, and ankle should all be fairly centered on that line. If any of the above mentioned joints falls forward or in back of that line, there could be trouble. The chronic strain patterns that can result can cause pain and compensation that often show up in other parts of the body. 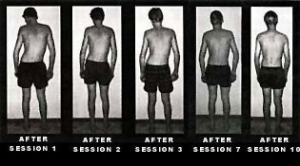 Vertical posture is not easily achievable by most people since the fascia (a type of connective tissue) has been “set in place” and retains out-of alignment holding patterns. A slumped over position or posture can be only temporarily corrected by asking the person to stand up straight. Once that person forgets about their posture, which they inevitably will, they go right back to that old slumped or bent over posture. This inability is caused through thickened fascia which sticks to itself in order to support the increased load on the muscles. Thickened and chronically shortened fascia can be caused by a number of things including physical injury and chronic emotional states. This thickening then prevents the body from regaining it’s flow and freedom or ease of movement. Thickening in one part of the body can cause problems or compensations in other areas. Rolfing® balances the fascial network by using its ability to hold a shape induced by applied pressure. The Rolfer® applies this pressure in an organized, carefully sequenced manner to effectively release this thickened fascia. The process of Rolfing® is set up in a series of ten sessions, each session has a goal of releasing the fascia in a specific area of the body.